Cleaning your Houston shower doors and tiles properly can enhance the beauty of your bathroom and can create a healthier and more hygienic environment for your family. Paying careful attention to the tiles and grout can ensure that these elements of your shower shine every day. Here are some of the most helpful hints for keeping your grout, tiles and glass clean. Using a towel or squeegee after each shower to remove excess water can help keep your shower and tiles looking great and performing as expected. Standing water can serve as a breeding ground for microorganisms, mold and mildew. By eliminating it after showering, you can often promote a cleaner and healthier environment for yourself and your family. Pay special attention to grout and tiles during this process to prevent stains or discoloration caused by these unwanted growths. Bar soap is a prime offender in creating soap scum on Houston shower doors, tiles and walls. Changing to liquid or foaming soap products can make a big difference in the amount of soap scum and buildup that occurs on your Houston frameless shower doors, tiles and grout. This can limit the amount of time needed to keep your bathroom looking its best. Gray or blackish deposits on grout should be addressed promptly and removed with a fair amount of elbow grease. White vinegar and Oxi Bleach are nontoxic and easy-to-use solutions that can provide real help in removing these mildew or mold deposits. Avoid using products that contain peroxide in conjunction with vinegar. The combination of hydrogen peroxide and vinegar can create a very strong acid that could damage glass, tiles and organic substances on contact. In most cases, vinegar alone should provide the cleaning power needed to remove mold and mildew growth from tiles and grout. Applying a coat of grout sealer can prevent damage to this integral part of your Houston shower enclosure. This should be repeated once or twice a year to ensure that your grout remains colorfast and that it does not deteriorate over time. 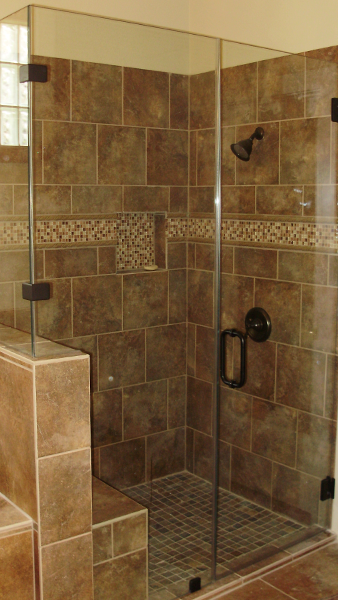 Sealing your grout can prevent the growth of mold and mildew while ensuring that your shower looks great year after year. Apple Glass specializes in all types of glass repair and installation. We offer mobile auto glass repairs and replacement services to help you manage your busy schedule more effectively. 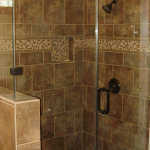 We also offer commercial and residential services, including the installation of frameless shower doors in Houston. If you need expert help with glass repair and replacement, call Apple Glass today at 281-296-0600 in The Woodlands or 713-680-1400 in Houston. We look forward to the opportunity to provide all of your auto and residential glass needs. This entry was posted in Showers and tagged Frameless Shower Doors in Houston, Houston Frameless Shower Doors, Houston Shower Doors. Bookmark the permalink.